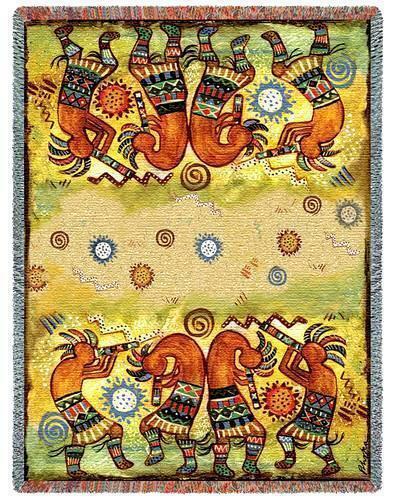 "Kokopelli Quartet Jacquard Throw" This throw features quartets of lively Kokopelli dancers playing their instruments on this brightly colored whimsical throw by Donna Polivka. This Jacquard woven throw will make a colorful and distinct addition to your Southwest decor! Cotton. Measures 53" Wide x 70" Long. PLEASE NOTE: Shipping ONLY within the continental U.S. Hawaii, Alaska, and Puerto Rico residents must contact seller for shipping quote before ordering.